Best grown in organically rich, dry to medium moisture, well-drained soils in full sun. Prefers a neutral soil. Avoid wet soils. Appreciates a sheltered location and a year-round mulch in the St. Louis area. Cut plants to the ground in early spring. Dividing the clumps every 3-4 years will help keep plants robust. Plants will slowly spread by creeping rhizomes. Artemisia dracunculus, commonly called wild tarragon, is a polymorphic species that is native to temperate Europe and Asia. It is also found in western North America, though many of these populations may have resulted from introduction and naturalization. It produces viable seed and will often self-seed. Its leaves produce variable flavor and aroma, sometimes lacking both flavor and aroma. It has a long history of medicinal uses, but the species is not often used for culinary purposes. It is a rhizomatous perennial or sub-shrub that typically grows to 24” (less frequently to 36”) tall on generally erect stems clad with narrow, linear to lance-shaped, light to medium green leaves (to 3-4” long). Greenish white flowers in narrow elongated panicles bloom in summer. Tarragon sold under the species name without reference to cultivar or variety may be the less pungent Russian tarragon, which is considered by most cooks to be significantly inferior for culinary use. See A. d. 'Sativa' for information on French tarragon. Specific epithet is a Latin word meaning a small dragon. Susceptible to root rot in moist soils, particularly poorly drained ones. 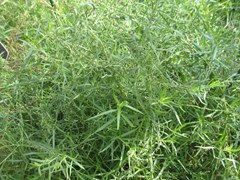 French tarragon does not always survive St. Louis winters, and wet soils in winter is a common cause of plant demise. Wild tarragon is an aromatic herb that is primarily grown in herb gardens. It also may be effectively grown in containers or window boxes. It is generally not considered suitable for borders or other ornamental plantings.